Dip into Cheesy Lasagna Dip at the next party with pita chips or Italian bread. 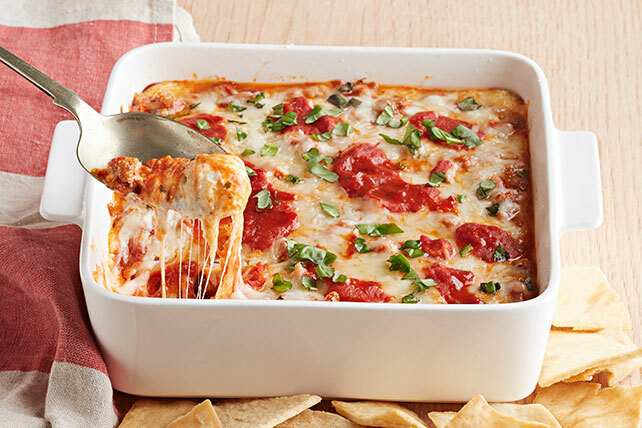 Guests are sure to enjoy this lasagna dip made with Italian turkey sausage! Remove casings from sausage if necessary; crumble sausage into medium skillet. Cook on medium heat 6 to 8 min. or until done, stirring frequently. Remove from heat; stir in 1 cup pasta sauce. Mix cream cheese, ricotta, garlic, 1/2 cup mozzarella, and half each of the Parmesan and basil until blended; spread onto bottom of 9-inch square baking dish sprayed with cooking spray. Top with sausage mixture. Combine remaining cheeses; sprinkle over dip. Top with spoonfuls of the remaining pasta sauce. Bake 20 to 25 min. or until hot and bubbly. Sprinkle with remaining basil. Serve with pita chips and/or cubed crusty Italian bread. Substitute a deep-dish pie plate for the baking dish.